Charleston is appreciated worldwide for its historical architecture, which was initially passively preserved simply because we were “too poor to paint, too proud to whitewash” and then actively by the concerted efforts of groups such as the Preservation Society of Charleston. But the appeal is not simply that we have old buildings but, more importantly, that our old buildings are, well, different. Nothing exemplifies this better than the Charleston Single House--those long, narrow multi-level homes that are ubiquitous downtown yet unique to Charleston. How did this type of architecture develop, and why is it distinctive to our fair city? A lot of people take for granted that colonial Charleston was initially settled by Englishmen. And that’s true--sort of. Some fifty years prior to the establishment of Charles Town, English adventurers were terribly busy trying to make a go of it on the islands of the Caribbean. Barbados, settled in 1627, became the cultural hub and the richest colony of the English West Indies after it adopted Brazil’s sugarcane crops and the practice of slavery. Barbadian land was at a premium, and the lure of the Colony of Carolana spoke to the younger or “second” sons of wealthy landowners who were by custom not included in the transfer of property as inheritance. According to Walter Edgar’s South Carolina: A History, there were about 130 colonists in the initial settlement of Charles Town in 1670--mostly English, with a few from Barbados. Over the next two years, about half of the white settlers and more than half of the enslaved blacks came from Barbados. For the first twenty years here, Barbadians constituted the majority of the white population and their culture took root. Yes, they were of English descent, but they were English-West Indian. “South Carolina and the Lower South culture that developed out of those small beginnings was as much the offspring of Barbados as was Jamaica or the other English Caribbean colonies,” wrote historian Jack P. Greene. Thus, South Carolina arose from a completely different cultural heritage than other early English American colonies. It’s actually fascinating history and if you’re interested in connecting some dots, take a listen to a story that aired on NPR in July, or get your hands on a copy of The Barbados-Carolina Connection by Warren Alleyne and Charles Fraser. Architectural historian Robert Stockton identified the English “unit-house” (unit meaning typical) as the common origination of the ‘single house’ built in Barbados and Charleston. In 17th century London, a unit-house was one room wide, rectangular, multi-storied with a gabled roof. Sound familiar? The concept was brought by builders to Barbados and Charleston, where the ‘single house’ evolved a bit differently according to local conditions and needs. Unfortunately, a series of fires destroyed most of the Barbadian single houses, and the few that remain have been significantly modified. 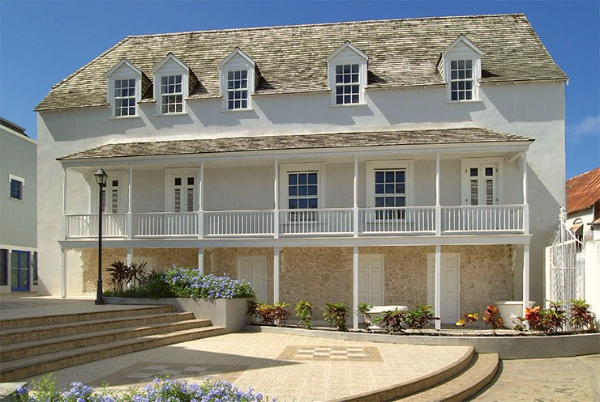 Architectural preservation is a relatively novel concept in Barbados, but recently an 18th century chandler’s house was restored and repurposed into the Arlington House Museum in Speightstown, north of Bridgetown. Who wants to take a trip? 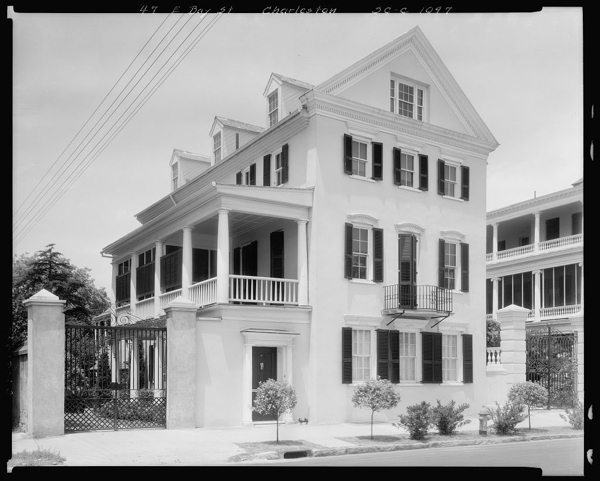 The first record of the Charleston Single House is from around 1700, when the fledgling city was still surrounded by walls and bastions and space was at a premium. It might seem plausible that houses were situated on the lot so that the side or short end faced the street in order to minimize frontage-based taxes. As confirmed by Mr. Stockton, this is a nice story but it just isn’t true. The dwelling design lent itself well to the long, narrow lots that were first laid out in 1680 and continued in the Grand Modell of 1725. The earliest example of this architecture still standing is probably the John Lining House on the corner of Broad and King Streets, possibly built pre-1700. As Charleston has had its fair share of fires, most of the single houses standing today were built in the 1800s. 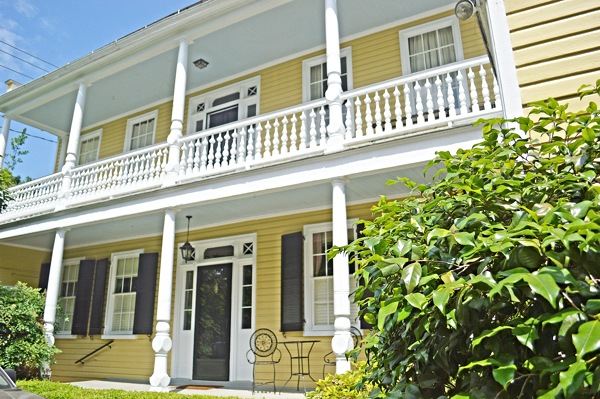 The 1826 dwelling at 11 West Street is an example of the Charleston Single House built prior to the regular inclusion of side porches, or piazzas as they are called in Charleston, although its door is located on the side of the building, away from the street, and opens onto a central stair. The rear condominium unit on the ground floor--a perfect pied a terre in the heart of downtown--is currently listed for sale with Lois. Many Charleston Single Houses were not built with the piazzas for which they are now so well known. The evolution of the design can be followed on old maps: initially first-floor piazzas were added, then two-story piazzas were added. These multi-level piazzas eventually became an integral part of the building plan of Charleston Singles, and an integral part of life in Charleston. The ‘Tideline receipt’ called for homes to position piazzas to face the south or the west in order to maximize the benefit of prevailing breezes. Since the homes were one room wide with a central stair, opening the windows and doors on the piazza-side allowed adequate circulation in the hot and humid climate. The lack of windows on the other side of the house is often regarded as “north side manners,” referring to the neighborly privacy granted by this civic design. We’re so glad someone was thinking ahead on this detail! 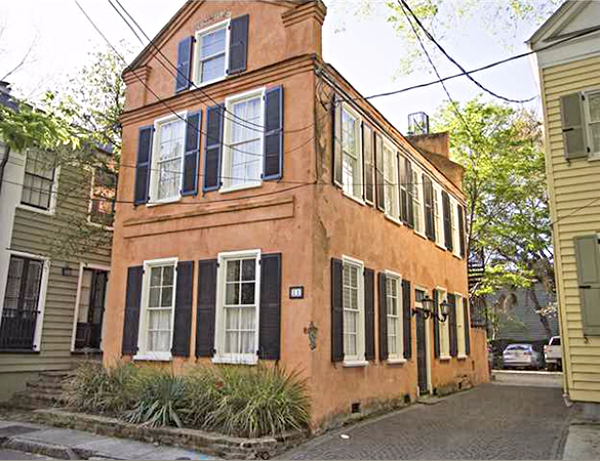 The circa 1890 Charleston Single House at 135 Queen Street is listed for sale with Lois. The evolution of the Charleston Single House, of course, meant the development of variations. One form that developed had an entrance from the street directly into a foyer with a side stair, instead of through the piazza. With the piazza on the opposite side of the home, the double parlors open up onto the piazza without the interruption of a central stair hall, highlighting the importance of the piazza to Charleston life. 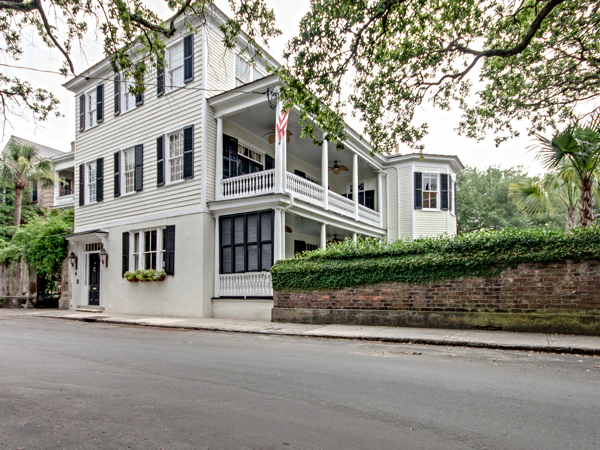 The stately home at 6 Legare Street, above, is one such example and is currently listed for sale by Lois. We can’t think of a more perfect urban-setting dwelling than the Charleston Single House. The screen or door from the street to the piazza offers privacy and separates any business activity from homelife doings. It’s situation on the lot ensures the residents a focus on the breezy piazzas and tranquil gardens instead of the bustling street scene. Multiple-level piazzas allow us to move the party upstairs for the best breeze on those really hot evenings as well as have some extra quiet time when we need it. Thanks, Charleston.